We’d love your help. Let us know what’s wrong with this preview of Whitechapel Gods by S.M. Peters. To ask other readers questions about Whitechapel Gods, please sign up. what do you guys think of "Whitechapel gods" ? Cecilia Rodriguez Please read my review and see my rating. Whitechapel has been cut off from the rest of London and is ruled by two mechanical alien gods, for the lack of a better description, Grandfather Clock and Mama Engine. John Scared schemes to usurp Grandfather Clock's power while Oliver Sumner and other revolutionaries look to overthrow both gods. Who will reign supreme? First of all, there were lots of things to like about this book. The hyper-industrialized pseudo-Victorian hell Whitechapel has become under the rule of Grandfather Clock and Mam Whitechapel has been cut off from the rest of London and is ruled by two mechanical alien gods, for the lack of a better description, Grandfather Clock and Mama Engine. John Scared schemes to usurp Grandfather Clock's power while Oliver Sumner and other revolutionaries look to overthrow both gods. Who will reign supreme? First of all, there were lots of things to like about this book. The hyper-industrialized pseudo-Victorian hell Whitechapel has become under the rule of Grandfather Clock and Mama Engine is a well-described place. The Boilermen and the Cloaks are both interesting antagonists, as are John Scared and Giselle. The clacks, a disease that causes people to slowly grow gears and wiring beneath their skin, is also quite innovative. The story had a lot of twists and turns. Things I don't like? I hate to admit that few of the characters really grabbed me. It took me forever to figure out that Oliver was the central character in the story. Too much was made of events that little to nothing was revealed about, such as the rise of Baron Hume and the creation of Grandfather Clock and Mama Engine. In my opinion, the story would have been better had it focused more on Oliver and revealed more backstory. That's not to say I didn't enjoy Whitechapel Gods. I'd recommend it to new weird, steampunk and horror fans. Officially, I'm giving this 3.5 stars. It might be upgraded to a 4 on a re-read. 3.5 stars. This was a very dark steampunk fantasy with shades of something like Gangs of New York, although not precisely that. We have a small band of people who are fighting for Whitechapel as well as queen and country while going up against Mama Engine and Grandfather Clock, who have set themselves up as gods. These gods were fascinating . In addition to creating a rather unique pair of gods, this allowed for people who were allied to each god. Some of these had clockwork mechanisms and some 3.5 stars. This was a very dark steampunk fantasy with shades of something like Gangs of New York, although not precisely that. We have a small band of people who are fighting for Whitechapel as well as queen and country while going up against Mama Engine and Grandfather Clock, who have set themselves up as gods. These gods were fascinating . In addition to creating a rather unique pair of gods, this allowed for people who were allied to each god. Some of these had clockwork mechanisms and some had furnaces but they all had started out as people. And then there were the humans. And they wanted Whitechapel back. This book's concept was really interesting, although in practice, I wasn't hooked as much as I wanted to be. I'm not really familiar with/a fan of this genre though, so I don't want to judge it too harshly. There were some interesting characters, the violence was brutal and kind of thrilling ;). I wouldn't recommend it to everyone, but if you like cyber/steam punk it's worth a pick up. Like the other steampunk novels I've read, Whitechapel Gods tends to get a little abstract at times, especially towards the end. However, it was a really entertaining read, and the world that S.M. Peters created is a very well developed one. I was completely immersed in the steel-and-smog Whitechapel ruled by Industrial Age gods, and I thought the steam guns and the Chimney (where all the "parts" that "don't work" are sent) were especially creepy. I look forward to Peters' sophomore effort. First off I love the cover, but after that there really wasn't anymore love. For my first foray into a steampunk novel I am greatly disappointed. Not so much with the setting, though it was a bit limited and at times only sketchily described, but with the character description, development and the complete lack of forth right explanation. You are introduced to characters with little or no description of what they look like or their motivation. As most readers would do, I think, you begin to pict First off I love the cover, but after that there really wasn't anymore love. For my first foray into a steampunk novel I am greatly disappointed. Not so much with the setting, though it was a bit limited and at times only sketchily described, but with the character description, development and the complete lack of forth right explanation. You are introduced to characters with little or no description of what they look like or their motivation. As most readers would do, I think, you begin to picture a somewhat generic Victorian man or woman only to find out two chapters later that they look nothing like what you pictured. Case in point--Hews, I saw as a thin elegantly dressed man with sideburns and neat hair; the reality was he was fat with mutton-chops (which I think all of the characters had) nicely dressed and always wearing a hat. I am still not sure what Oliver, who is the protagonist of the novel, even really looks like other than tall. In my head he was older and had a trim beard. Again a few chapters later this was disproved. There is also a disease infecting people of Whitechapel, though not all, called the clacks. Tom has clacks, but I am not sure what it looks like or how it really was so bad for him. A lack of detail on the clacks. The characters knew way more than the reader and yet none of them took the time to really explain their present situation. Was there a prequel and I missed it? I felt like I was to accept the reality and not to question how it really came to be only. Eventually you learn about Hume, Mama Engine, Grandfather Clock and the "child" how all it all began around the last third of the novel. A little to late, but if I knew how they came to be or what they were before the that point I would probably have stopped reading. Each chapter begins with a quote from a book, completely out of order if you believe the numbering system attached to each quote, at first it was hard to tell if this was an actual book being quoted or not. Adding to the confusion is that actual authors are quoted at divisions within the novel. It is until later that you are made aware of Hume's book Summa Machina and realize these are quotes from it. Another thing that bothered me is that the events in the book happen over a short frame of time like three days. It is the DaVinci Code of steampunk fantasy. Quick review: A nice, little, self-contained novel. I haven't read much in the urban fantasy/steampunk genres but Peters' Whitechapel reminds me of Mieville's New Crobuzon in its atmosphere and in its half-human/half-machine inhabitants. Peters' work isn't as mind-twisting as Mieville's but it's reasonably inventive and fresh, and the characters are not simple, one-dimensional caricatures. In fact, the most evil and dangerous character is the human John Scared, not the putative enemies Grandfath Quick review: A nice, little, self-contained novel. I haven't read much in the urban fantasy/steampunk genres but Peters' Whitechapel reminds me of Mieville's New Crobuzon in its atmosphere and in its half-human/half-machine inhabitants. Peters' work isn't as mind-twisting as Mieville's but it's reasonably inventive and fresh, and the characters are not simple, one-dimensional caricatures. In fact, the most evil and dangerous character is the human John Scared, not the putative enemies Grandfather Clock and Mama Engine. It was hard to get into. The e-book jumped around between narrators with no indication of change which made it difficult to follow, especially at first. Overall, I liked it but I didn't love it. I couldn't get past page 69. This book didn't grab me and I found the descriptions of Whitechapel wordy but vague. I couldn't get a picture of the place in my head. This was our book club pick for November. I tried to read it I really did, but it’s just not my thing. Thank you, next. This is a perfect example of being properly fooled by the cover art and title of a book. When I think Whitechapel I immediately think Jack the Ripper. The idea of a steampunk era Jack was very intriguing, however this has nothing to do with that. The cover art doesn't help to dissuade that association either, rather it fueled it for me. Once I had the book in hand, and after realizing the above, the blurb on the back still intrigued me enough to read. In Peters' version of Whitechapel two Gods, M This is a perfect example of being properly fooled by the cover art and title of a book. When I think Whitechapel I immediately think Jack the Ripper. The idea of a steampunk era Jack was very intriguing, however this has nothing to do with that. The cover art doesn't help to dissuade that association either, rather it fueled it for me. In Peters' version of Whitechapel two Gods, Momma Engine and Grandfather Clock, are vying for control. Having cut off Whitechapel from the rest of London with an imposing wall these Gods keep their humans in check using their mechanical police force. However, a group of rebels are making efforts towards freedom and the destruction of these Gods, while another man seeks to obtain the power and become a God himself. Peters' world is not your traditional victorian steampunk adventure, he successfully removes the beauty of the traditional idea and turns his world into a boiling furnace of mechanical hell from which no man will find eternal reset. His world is full of evil deeds, power struggles and the control of humanity. There were many things to like about this novel. The industrial victorian landscape and the expansive world that was created above the ruins of Whitechapel. The mechanical henchmen, the Chimney, and the Clacks, a horrible clockwork decease that transforms people into part machinery removing humanity and any hope of a peaceful death. It was difficult to get 'hooked' on this story, Peters' has a definitive writing style that takes a few hundred pages or so to get your bearings. Additionally the plot and main protagonist were a bit slow to reveal. Once the story picked up it was still not fast moving due it is slow plot building and lack of explanation for the reader. Part of the momentum issues were due to the impressive number of influential characters and the way the story moved between the point of view of each. The 'dream' sequences were odd especially without explanation, and when the consciousness of Aaron started running around as a pet clickrat an explanation was too far overdue to insert one. This novel was a good start for Peters'. It struggles with pacing, transitions, and the sheer number of characters. It left me too split to invest myself fully, each character was undeveloped in my opinion and ultimately my favorite was not the protagonist. Peters' essentially throws the reader into the clockwork infested waters without a clear investment into world building. The last thing that I felt was not executed well was the only female character. She was introduced as a very tormented young lady with potential however she is quickly written into the roll of the love interest of the protagonist. Overall I give this 3 out of 5 stars. Сразу признаюсь, что Whitechapel Gods я дочитать не смогла, хотя до последнего цеплялась. Но здравый смысл наконец взял верх и посоветовал не тратить время на книги, которые доставляют больше мучений, чем удовольствия. Кто я, чтобы спорить. Прочитав половину книги, я так и не встретила ни одного героя, способного минимально заинтересовать, не говоря уже о симпатии. Единственный значимый женский персонаж – бывшая дама легкого поведения, притащившая следом из старой жизни вагон и маленькую тележку Сразу признаюсь, что Whitechapel Gods я дочитать не смогла, хотя до последнего цеплялась. Но здравый смысл наконец взял верх и посоветовал не тратить время на книги, которые доставляют больше мучений, чем удовольствия. Кто я, чтобы спорить. Прочитав половину книги, я так и не встретила ни одного героя, способного минимально заинтересовать, не говоря уже о симпатии. Единственный значимый женский персонаж – бывшая дама легкого поведения, притащившая следом из старой жизни вагон и маленькую тележку комплексов и неуверенностей. Это не так страшно, ее внутренний монолог можно пропускать мимо ушей. Но все остальные фигуры на поле, в том числе протагонист (которого я смогла четко выделить только перемахнув через четверть книги) – скучные до зубовного скрежета. Причем одномерными их ни в коем случае не назвать – у каждого есть предыстория и свои особенности, но вот только это не делает их привлекательнее ни на грамм. Ну да, какие-то дядьки носятся со своими фракциями, шайками и восстаниями, но на всю их возню глубоко наплевать. Книга написана таким языком, что я часто спотыкалась на ровном месте. Иногда не могла понять, кто вещает и что происходит, и еще ступорили некоторые выражения, за которыми приходилось лезть в словарь. Некоторых слов он в паре с гуглом так и не распознал, что можно списать либо на слишком заковыристое авторское словообразование, которому он не потрудился дать объяснение, либо на описки. Последние меня раньше не смущали. История на протяжении неприлично большого количества страниц топчется на месте, ходит кругами вокруг одних и тех же персонажей, подбрасывая кусочки информации о положении дел в мире мучительно медленно. Подобные заигрывания могут быть хороши для неторопливых фэнтезийных циклов, где пролог по определению должен быть обширным и затягивающим. Но Whitechapel Gods просто издевается, на первых страницах бросая в пекло, ничего толком не объяснив, с тем, чтобы тут же затянуть волынку скукоты на десять глав. Причем все так же – не давая минимальных знаний о мире и пищи для размышлений. В сочетании с безликими героями это просто жестоко. Из хорошего – атмосфера. Меня манят мрачные миры, где царствует безысходность. Отсутствие стеснительности в описании жестокости и ее результатов, как ни странно, добавляет книге пару баллов – океан gore&violence вписывается в историю идеально. Задумка про богов легко могла бы выстрелить, если бы не потонула в полнейшем отсутствии вдохновения на всех остальных фронтах. Чувствуется необыкновенной силы потенциал, который мне, к сожалению, оценить не придется. I usually don't leave reviews but I gave 1 star to this one without even finishing it and I wanted to explain. I wanted to like this book. I really did. I was so eager to read it (mostly because of the cover, which is awesome) but it was a huge disappointment. Let's start with the names. I understand that you don't want to be repetitive and star all the sentences with “John did whatever”, but if you are going to call him by his first name in the first sentence and in the next you are going to ca I usually don't leave reviews but I gave 1 star to this one without even finishing it and I wanted to explain. Let's start with the names. I understand that you don't want to be repetitive and star all the sentences with “John did whatever”, but if you are going to call him by his first name in the first sentence and in the next you are going to call him by his surname at least let me know that it is the same person. If not I will think there are more people in one scene than there actually are. It was kind of annoying. The scene jumps were also confusing. I didn't know what to pay attention to. When a scene was finally making sense the story changed to another point of view, with a completely different setting and new characters I knew nothing about. As I said, confusing. Speaking of change of point of view, once it was changed I was dropped in the middle of the action. I don't mean this in a good way, like when right from the start exciting things start to happen, but in the way that I had the feeling I had opened the book randomly and started reading the first page that popped up. I didn't know what was going on. Who are this new characters? Why are they doing what they're doing? What do they want to achieve? Why should I want them to win? Part of the blame of not knowing what was going on is the lack of descriptions. This is a fantasy book, which means that some stuff doesn't exist. Some things are just in the author's imagination and it's his job to let me know what they are, what they look like, what they do. At one point there's a doctor that cuts a patient with a scalpel and instead of bleeding, the cut oozes oil. And then they move on to the next action without even blinking… WTF!!? Why is that dude bleeding oil? What is going on? Why is he half machine? Is this normal in this world? Well, the book has zero fucks to give about your confusion as it moves on to the next point of view and story. The few pages I read left me thinking that there was maybe a prequel I knew nothing about and that's why I didn't know these people. Kind of like when you hang out with a group of friends that are not your own and they have all these secret jokes they are not letting you in on. I don't like that feeling. First, let me say that I wanted to love this book. From its awesome cover art and the summary on Amazon, it looked interesting enough. Authored by S.M. Peters, this debut is a Steampunk-themed story where two mechanical gods, Mama Engine and Grandfather Clock, rule London. You follow the rebels of an uprising who live in this dirty, dystopian city and who only want to free themselves from these mechanical monsters and their murderous henchmen. It took two months for me to read Whitechapel Gods, First, let me say that I wanted to love this book. From its awesome cover art and the summary on Amazon, it looked interesting enough. Authored by S.M. Peters, this debut is a Steampunk-themed story where two mechanical gods, Mama Engine and Grandfather Clock, rule London. You follow the rebels of an uprising who live in this dirty, dystopian city and who only want to free themselves from these mechanical monsters and their murderous henchmen. It took two months for me to read Whitechapel Gods, and I struggled the entire way, mostly out of disinterest. The prose was easy enough, but the storyline switches gears so many times, it was really hard to follow. I lost interest, forcing my way slowly, until about 2/3 of the way through when it seemed like the characters were actually about to do something important. The characters seem very interesting, but their individual lives seem to overtake the book, making the plot lose its momentum. Have I mentioned just how many players there are in this drama? There’s Oliver (the protagonist), and Missy, Tom, Aaron, Scared, Penny, Bergen, Heckler, Bailey, etc. Delving into so many lives, it’s no wonder I got lost. Their abstract dream and drug sequences proves nothing but to confuse more than reveal anything plot-worthy. In saying all that, though, I believe that my favorite characters are Tom, half man and half machine, and his pet clickrat Jeremy Longshore (who we later find out is embodied by Aaron). Tom is a large man-machine who, yes, takes a licking and keeps on ticking, but his demeanor is gentle and that of a small child. His pet Jeremy is very faithful and turns out to be pretty useful. He convinces metal hounds, through a series of clicks and nods, that his friends are not a threat. Their relationship shows us more humanity than the real human beings in the story do, which might be a point the author is trying to make, but it gets lost in the muddle. Sort of at the low edge of 2.5 stars, I think. The publishing imprint labels this "fantasy," and marketing trends would call it "steampunk," but I think it would be more accurate than either to call it body horror. The novel's clearest and most vivid descriptions are saved for the (many) instances when flesh and machine are violently, gruesomely melded, which means this is a novel that takes a strong stomach. The industrial cancer that affects people in the story's Whitechapel, turning their bodi Sort of at the low edge of 2.5 stars, I think. The industrial cancer that affects people in the story's Whitechapel, turning their bodies progressively into machines, is an obvious metaphor for the dehumanization process of the industrial age's factories generally. But it's also a metaphor for the genre-melding that's going on here: Whitechapel Gods isn't consistently magical enough for fantasy, or consistently explicable enough for sci-fi, and it lays out its evils too plainly to provoke the unsettling revelations of horror. It grinds along, powered by its unlikely mixture of blood and gears, capable of delivering power in places but much less capable of subtlety or grace. And while the combination of industrial-era problems with otherworldly gods seems imaginative at first glance, I was disappointed at how many stale assumptions and stereotypes were incorporated into the story without critique: the traumatized young whore (the only female human character with any impact on the plot), the old Chinese woman running the opium den (the only non-white human in the story at all), the mysterious mind-altering drugs of "Far East" origin, the division of the gods' powers between male cold intellect and female unreasoning desire. Whitechapel has been cut off from the rest of England, by a seemingly impenetrable wall forged by the new gods Mama Engine and Grandfather Clock. Between them they have virtually enslaved most of Whitechapel, turning it into a mass of growing metal and ash and smog covered streets, and spreading their disease that cause men to start growing mechanical parts and replacing their followers hearts with furnaces. But, a rebellion is growing and a weapon forged that can kill these new gods and bring Whitechapel back into England’s fold. I really loved the idea of this book, with the man made gods, and mechanical man and the idea of the “clacks” a disease that causes people to grow metal growths is brilliant and unique. I also liked that there was plenty of action in these books as well. The character John Scared, the villain was also a really good character he was wicked and unapologetically depraved and although I didn’t like him, he will be what I remember most about this book. However, I didn’t like how the story was told, by this I mean that you heard a lot about the rebellion, but, much to my most disappointment you never really learn anything about how the gods were created and Baron Hume and the history behind how Whitechapel became walled in. Also, I found this book to be quite unfocused and it dragged along for the first 250 pages or so and then suddenly at the end everything started to happen, and it was a long wait for an ending that for me never really paid off. This isn’t a book I would really recommend, which I find really frustrating as it had such good ideas and a really atmospheric setting. Whitechapel Gods marks my first foray into the steampunk genre during my steampunk extravaganza this month. It is perhaps a bit of an odd book for a first choice since it is entirely lacking in airships and heavier on horror then adventure but it is rife with clockwork automatons and steam powered weaponry. In truth Whitechapel Gods is something like steampunk as envisioned by H. P. Lovecraft or Stephen King. 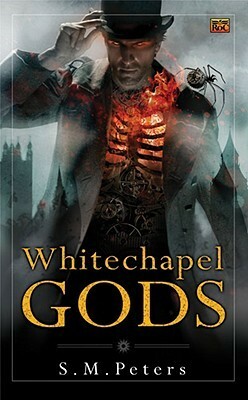 In a post-industrial London, Whitecapel has been walled off by the strange deific figure Whitechapel Gods marks my first foray into the steampunk genre during my steampunk extravaganza this month. It is perhaps a bit of an odd book for a first choice since it is entirely lacking in airships and heavier on horror then adventure but it is rife with clockwork automatons and steam powered weaponry. In truth Whitechapel Gods is something like steampunk as envisioned by H. P. Lovecraft or Stephen King. In a post-industrial London, Whitecapel has been walled off by the strange deific figure known as Grandfather Clock, inscrutible and unwilling consort to the even more unfathomable Mama Engine. Smoke and toxic gases turn the already dingy atmosphere of Whitechapel into a hostile place while a horrid clockwork disease transforms citizens into horrid amalgams of man and machine; robbing them of any hope of death. Men given over to Grandfather Clock collect citizens to be added to a monstrous construction of man and machine while silent automatons known as the Boiler Men enforce Grandfather Clocks will and stamps out rebellion. Amidst this oppressive atmosphere a rag-tag bunch of criminals and patriots seek to kill both gods and free the downtrodden citizens of Whitechapel. Whitechapel Gods is a novel rife with familiar sights twisted into horrific visages and though the novel suffers from some issues with pacing manages to ensnare its reader with that imagery. First thought: too many characters. It wasn't until I was in chapter 4 that I realized "Oh. So Oliver is the main protagonist." The plot also starts out slowly (oh so slowly)but finally picks up around the last third of the book. My second issue with the book was the female protagonist, Missy: the attempt to make her out to be the "strong female" of the story fell flat on its face as she continuously carried on an internal dialogue I can only assume was developed to garner sympathy for her chara First thought: too many characters. It wasn't until I was in chapter 4 that I realized "Oh. So Oliver is the main protagonist." The plot also starts out slowly (oh so slowly)but finally picks up around the last third of the book. My second issue with the book was the female protagonist, Missy: the attempt to make her out to be the "strong female" of the story fell flat on its face as she continuously carried on an internal dialogue I can only assume was developed to garner sympathy for her character. Instead it was simply irritating and made me hope that she would die off soon so I could be free of reading any more of her whining and one-track mind. The forced relationship between her and Oliver also seemed last minute as there wasn't any real chemistry between the characters at all aside from the fact that she was the only possibility for a heterosexual coupling, and, since he's the hero, of course he has to "get the girl". I am not an expert in Steampunk fiction, but I rather enjoyed this book. While it may not have had a resolution that seemed complete, I found myself engaged in the character and feeling the sense of the atmosphere of the work. Given the actual Whitechapel's history, I felt Peters did well to engage the concept and make it his world. The struggle the protagonist has determining if he should even try to rebel seems genuine enough from the start and his history is fleshed out significantly to demon I am not an expert in Steampunk fiction, but I rather enjoyed this book. While it may not have had a resolution that seemed complete, I found myself engaged in the character and feeling the sense of the atmosphere of the work. Given the actual Whitechapel's history, I felt Peters did well to engage the concept and make it his world. The struggle the protagonist has determining if he should even try to rebel seems genuine enough from the start and his history is fleshed out significantly to demonstrate his decisions. Overall, the book felt unique enough to be worth the read and, while perhaps the end was not filled with perfect explanations and a sense of completion, the work in its entirety feels fairly character driven and unique. Up until the last quarter of this book I was utterly in love with it. I liked the characters and their complexities, I loved the glimpses of this world it was set in, and I was SURE it would all make sense by the end. Buuuuuut no. No explanations were ultimately given for why a dead person could end up in the body of a mechanical rat, or how a creepy old man could have a steam goddess for a lover, or even how these gods of Whitechapel came to exist in the first place. A few token lines were added Up until the last quarter of this book I was utterly in love with it. I liked the characters and their complexities, I loved the glimpses of this world it was set in, and I was SURE it would all make sense by the end. Buuuuuut no. No explanations were ultimately given for why a dead person could end up in the body of a mechanical rat, or how a creepy old man could have a steam goddess for a lover, or even how these gods of Whitechapel came to exist in the first place. A few token lines were added here and there - he was guided by a lost god, he took drugs that turned him into a living consciousness, they came from somewhere else - but nothing satisfactory. It's disappointing that something with so intriguing a concept and so promising a first half could let me down so coldly. And don't even get me started on the token female character who showed so much potential to be an interesting, complex character who was reduced to The Love Interest for no apparant reason. Whitechapel,London - The citizens of Whitechapel are under the rule of two gods - Grandfather Clock and Mama Engine. The focus of these two gods/machines is to continue to function, at all cost. There are cloaks - humans who have chosen to become part of the machines, Boilermen - a frightful creation solely from the machines themselves, and a cancerous disease, called clacks, that transforms innocent humans into a sort of half-human, half-machine entity. The scenes of machine and flesh merging a Whitechapel,London - The citizens of Whitechapel are under the rule of two gods - Grandfather Clock and Mama Engine. The focus of these two gods/machines is to continue to function, at all cost. The scenes of machine and flesh merging are vivid and graphic, giving the book a raw, gritty edge. The main characters are slow to be revealed and while all are not wholly likable, they offer varying degrees of background and different points of view throughout the story. In the interest of full disclosure, I have not actually finished this book. I do think I have read enough however. 150 pages into a 350 page book would seem like enough time to establish at least on interesting character, especially considering that each chapter is from the perspective of about 4 different characters. It would also be enough time to establish at least a bit of world history or a bit of idea about the setting. This was the biggest problem. The world this takes place in is a radic In the interest of full disclosure, I have not actually finished this book. I do think I have read enough however. 150 pages into a 350 page book would seem like enough time to establish at least on interesting character, especially considering that each chapter is from the perspective of about 4 different characters. It would also be enough time to establish at least a bit of world history or a bit of idea about the setting. This was the biggest problem. The world this takes place in is a radically different white chapel London, as near as I can tell. The author never really gets too much into the world which is a shame since its the only reason to pick up the book. This is one of the darkest books I've ever read. The Whitechapel section is cut off from the rest of London by two gods-Mama Engine and Grandfather Clock. If they had more serious names, they couldn't be creepier. The events in this book take place a few years after the uprising led by Oliver Sumner. Members of resistance got their hands on a weapon, designed by Jack the Ripper-like man, which could destroy the gods. Grimy, harsh, and not at all the exciting romp I was expecting. It was hard to get into at the beginning -- mostly because of too much frontloading of information -- but that evened out fairly quickly. The writing was overwrought at times, and the author actually used the word 'irregardless' (and not as a joke), but for the most part the book was a compelling read. I'll be interested to see what else Peters writes. This book needed a good editor. The ideas were intriguing but half the time you actually couldn't tell who was speaking to whom. The characters lacked definition and some of the action was muddy. It was a slog to finish. To be honest I really like steampunk. Unfortunately this book didn't work for me. There have been passages I liked and others which totally confused me. I couldn't find the rhythm of the book. I also had problems with the style of the author. Cool cover, but can't get past page 50. And I've tried reading this three times. In brief: A steampunk Whitechapel has been in the thrall of Grandfather Clock and Mama Engine for a generation and just about everyone wants them gone. Will Oliver be the man of the hour? Thoughts: The steampunk elements are incredibly steampunky, and pretty unnerving. The themes of man, machine, power, and man as machine are interesting. The plot is … pretty standard, unfortunately, and the characters don’t really bring it to life. Close, in parts, but not quite. There are some spots where the p In brief: A steampunk Whitechapel has been in the thrall of Grandfather Clock and Mama Engine for a generation and just about everyone wants them gone. Will Oliver be the man of the hour? Thoughts: The steampunk elements are incredibly steampunky, and pretty unnerving. The themes of man, machine, power, and man as machine are interesting. The plot is … pretty standard, unfortunately, and the characters don’t really bring it to life. Close, in parts, but not quite. There are some spots where the plot diverges from, “Oliver will get out of this and keep saving the day” and a fair number of those were cool, but lost points for being slightly confusing. Like, I had to stop and read the passages over to work out what had happened? But if all you want is literal human machines and clockwork animals and giant steam guns and robots, well, have I got a book for you. S. M. Peters is not an ex-spy, ex-lawyer, ex-physicist, ex-Navy SEAL, or ex-Wall Street executive. He lives in Middle-of-Nowhere on Lake Okanagan, British Columbia, from where he commutes into the city to spend all day telling adolescents to fix their comma splices and spell “a lot” as two words. He is happily married and owns more animals than the Calgary Zoo.